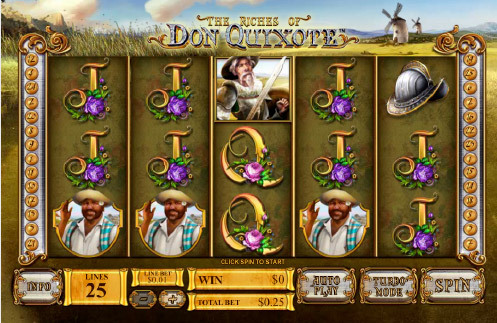 Fly Casino has added The Riches of Don Quixote. Asked for by our members, this new slot at Fly Casino is a 5-reel, 25-line game that is based on the classic book that is one of the most read books ever. This new stunning slot game provides you with the thrill of stacked symbols and a free games feature whereby you get 10 free along with an increasing multiplier up to 6X! Also, during free games, there is a sticky wild symbol on the middle reel for added excitement and winnings. Sunday 77% Blast! On Sunday from 00:00GMT until 23:59 GMT, all members on their first deposit of just $/£/€30 or more will receive 77% up to 77.00. 110% Bonus! From 00:00GMT until 23:59 GMT, all members on their deposit of $/£/€10 or more will receive a 110% bonus up to $/£/€110.00. $25.00 X 5 TUESDAY! From 00:00GMT until 23:59 GMT, all members are invited to receive a $/£/€ 25.00 bonus on your first deposit of $/£/€ 25 or more. Claim it 5X!